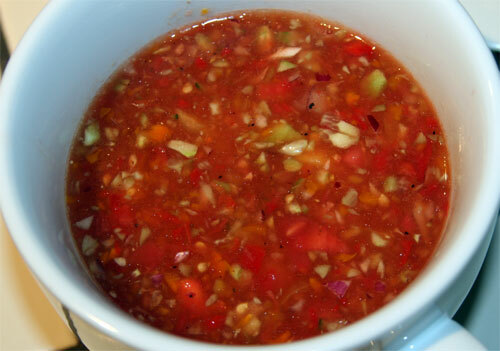 Gazpacho is great for the summer and requires no cooking. Below are two different recipes. The first is a recipe my parents have been raving about, originally from SimplyRecipes.com. The second is for an authentic Spanish Gazpacho from The Splendid Table guest David Rosengarten. It makes a creamy, silky soup with just a few more steps, but less ingredients, than the first recipe. I have made some version of this dish many times. Use your best judgment to substitute and tweak my directions as they work for your tastes. For a prettier presentation, leave the chicken on the bone or use whole breasts. I prefer to use dark meat and take the bones out in the kitchen to save them for stock. Whether or not the bones make it to the table, I still have to cut my kids food, so making bite size pieces ahead of time means we can all enjoy our food with less table work. Pan cook chicken legs, turkey, or chicken or beef cut of choice. Remove meat from pan, but leave oil and bits. Fry sliced shallots (or onions) and mushrooms in ample oil and/or margarine in the same pan. Sprinkle generously with flour and continue cooking on medium-low. Add white wine, beer, or broth and scrape up yummy bits. Add green olives, capers, sun-dried tomatoes, or other ingredients (optional) and return chicken to the pan. Continue cooking if necessary or cover and keep warm until ready to eat. Serve over brown rice or bulgur. There's nothing like a nice crisp, even sweet, salad on these hot summer days. Putting strawberries, orange sections, dried cranberries (preferably unsweetened), and candied pecans on a salad is nothing new to me. A couple weeks ago I made a salad with some of these things (and yellow bell peppers), but the unique part was the greens. Instead of packing the dressing with dried herbs, I put fresh herbs right in the salad, many from my window garden. I mixed my own fresh romaine, finely chopped chives, tarragon, and a few other herbs, with store bought Italian parsley and baby greens. I used some of the juice that came out of the oranges when I sectioned them to start a dressing. A basic salad dressing needs some fat, acid, and salt. Acid can be fresh lemon juice or some type of vinegar; salt can be any kind of salt crystals, soy or tamari sauce; and fat is usually at least half olive oil. I also like Dijon mustard and something sweet, like orange juice, honey, date syrup, etc. If you taste it, use a piece of lettuce or vegetable. It should be strong, and tasting on a spoon or your finger won't give you an accurate idea. If you dress the salad, always start with less than you think you will need. Consumers across Israel have been pressured to stop buying cottage cheese to support the cottage cheese boycott, sparked by a price hike. Prices have gone up to about 6.5 NIS for a 25 gram container ($1.89 for about 1/4 cup). 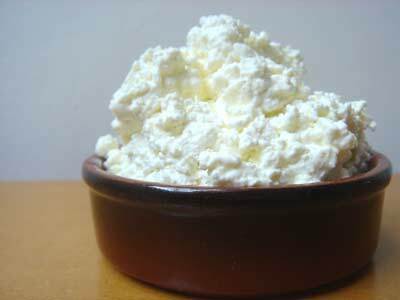 With close to 90,000 people "attending" the boycott on Facebook, I thought I would share a recipe to make your own cottage cheese. I just went to take pictures of my moist, delicious muffins, but they're all gone! I usually make my muffins with some ground dates or prunes and some brown or white sugar, but this is the fist time I've attempted to make muffins with no sugar. I don't know if these are technically diabetic approved, but you can surely eat them and feed them to your family with less guilt. I am no expert, but my understanding is that the fiber in the fruits, vegetables, and whole wheat flour, as well as the beneficial effects of cinnamon, should slow the body's conversion of the ingredients into simple sugars (needing insulin) making them low-glycemic. I welcome anyone who can comment on this. My friend Yael Schuster, of Haifa, Israel, posted this mouthwatering photo on Facebook and I asked her to write a post about it. Yael is clearly a natural blogger, but has her hands full with two beutiful boys. She also just completed her PhD in Chemistry from the Israel Institute of Technology in Haifa. What caught my attention about this dessert, was the pairing of the ultra-trendy cupcake with the ever-classy tiramisu. Shavuot celebrates the giving of the Torah to the Jewish people and holiday traditions include eating dairy and staying up all night learning Torah. Visit Yael's Sweet Shop on Facebook to see her beautiful confections or order treats! Shavuot has got to be my favorite holiday. It's the one time I don't have to be ashamed of my intense relationship with butter and 38 % milkfat cream. Heck, it's even on sale! It's fun to teach the kids about something that doesn't involve plagues or fasting. I don't even mind the staying up all night- somebody else, of course. Not me- I stay home to "watch" the kiddies. BUT, I am sorry to say, I do not like cheesecake. I don't like the soft, soggy Israeli excuse for cream cheese. I don't like paying 60 shekels [$18 today] to make one cake with said pathetic cream cheese. I don't like making crumb crusts. I don't like carting around ten pounds (sorry, 4.5 kilos) of dessert in one pan. And I just don't like the taste of bland sugary cheese. This year, when I was asked to bring dessert to a friend's house, I decided that the drown-yourself-in-dairy holiday needed to take a different approach. Tiramisu. In cupcake form. Genius.